1) As you will know from the various pictures which I know have been submitted, Collett 3205 successfully re-entered traffic over the May Bank Holiday 1950's & 60's gala which was very well attended with figures well up on last year's event. With three working steam locos all in BR era livery (3205 BR Green, 5786 & 5526 both BR Black) matched with both chocolate and cream plus blood and custard coaching sets, the railway really looks like the 1950's & 60's period. 2) Our passenger figures are holding up particularly well too this year and, at the end of the May Half Term holiday week, we had carried just five passengers fewer than in 2009 which hopefully augurs well for the rest of the season. 3) With heavy freight former GWR 2-8-0 No 3803 now away on hire to the Glos & Warks Railway until the end of August, this is the first season ever that every working SDR steam loco has been away on hire to other railways: 5786 visited the SVR in March; 5526 visited the Bodmin in April; 1369 is on long term hire to Chinnor & Princes Risborough Railway and, dependent on successful running in trials, 3205 should visit the SVR briefly in September as part of their 40th anniversary year but is otherwise not for hire. 4) The SDR Trust Board has also taken the decision to offer loco 3803 for sale in order to help pay for the costly restoration of 6412 and also fund other important development projects on the railway. The guide price is £350,000 and the loco has six years left on its ticket -- expressions of interest to me please (01364) 643536 or e-mail: DickWood@southdevonrailway.org . 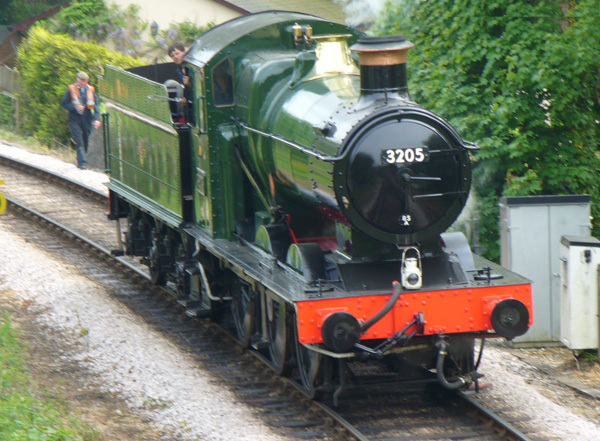 5) Two visiting steam locos have been confirmed for events this Summer: WD liveried former GWR Mogul No. 5322 from the GWS at Didcot is visiting for the SDR's 1940's and military themed weekend on 10/11 July and, subject to a retube being completed in time, former GWR 4-4-0 Dukedog No. 9017 "Earl of Berkeley" in BR Black livery from the Bluebell Railway is scheduled to appear at both the SDR's Rails & Ales (28-30 August) and Heritage Transport (11 & 12 September) weekend events. The August and September events are therefore expected to be very popular and to have a distinct "Cambrian in BR" era feel with the SDR's home based fleet of 3205, 5526 and 5786. Another former GWR loco is also expected for both events but as yet is unconfirmed.